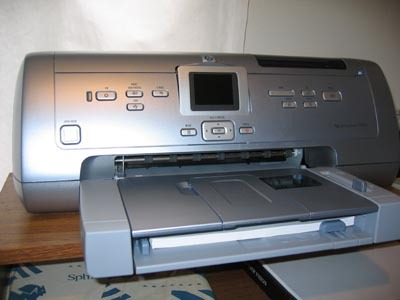 Got a new printer the other day, an HP Photosmart 7960 from Costco. It was at a pretty good price and I was tired of my Epson 2000P with its old drivers, not so good plain paper quality and expensive pigment inks. Don’t get me wrong, the Epson could produce beautiful prints and could do it up to 13″x19″ paper size too but that printer was huge for my needs. I really needed something more for printing correspondence and such. The Epson didn’t use ink, it used pigments which are fade-proof, but don’t print that nicely on plain paper. So I got this printer, tried to install the software and the computer didn’t want to recognize the printer. After long chats/talks with HP online (they are very patient and helpful, beyond the call of duty), numerous driver reinstalls it became obvious to me that it was my computer software and not the printer. The printer works flawlessly when connected to my Windoze laptop and when I installed the software on a back-up partition on my laptop, but my main working system wouldn’t work. So this meant my final option which I put-off until today, was to re-install my operating system. So I spent several hours today re-installing and updating my operating system (Mac OSX 10.3.6) and reinstalling the printer software. Now the printer works fine, it really is a nice printer, but I need to fix some applications on my computer which broke in the process of the system redo. And I need to go back to Costco for another problem, I had 80 5×7 digital prints done for an order, but there was a glitch in the system and it printed digital streaks over all 80 prints. So I have to go back and redo the order today. Anyone want to buy a used Epson 2000P?